CONCORD, NC - Registration is now open and posted on the WKA website for the next Bridgestone Manufacturers Cup race happening at the CTECH Manufacturing Motorplex at Road America. You can view the entry list, which is updated as people register, as well. 2. In a effort to help control costs the WKA Board of Directors voted and approved starting with Road America for KA100 Jr and KA100 Sr, it will now be 1 Set of YLC race tires for the event. Tires must be new on Day 1, same set to be used on Day 2. We look forward to seeing everyone at the CTECH Manufacturing Motorplex at Road America for another great event! CONCORD, NC - Bringing a close to an amazing WKA Bridgestone Manufacturers Cup season, GoPro Motorplex in Mooresville, NC., will be the next stop for the popular series. As one season comes to a close, WKA Officials will introduce elements that will be a part of the campaign’s 2019 season. Introducing new classes for 2019, WKA will offer those classes as Local Option Classes for GoPro. LO206 Cadet and KA100 Junior will be added to the line-up all weekend to help racers prepare for the 2019 season. Additionally, as announced by the Board of Trustees from their Summer Rules Meeting, WKA will install the push-back bumpers to 2019. To help the racers prepare, the system will be required at the GoPro event, with no penalties. Proven already in other series to help clean up driving craft, racers will get a taste of the system at the event to prepare for next year, with no penalties issued for infractions during this test. Finally, WKA will host its annual WKA Membership Meeting at the Mooresville facility, Friday, October 26 immediately following the Practice Schedule. Entry Forms, Schedules, and Information for the Top Kart USA Grand Nationals are available now at www.worldkarting.com To easily register online, CLICK HERE. CONCORD, NC - Giving back to the racers once again, WKA has brought new enhancements to the upcoming Bridgestone Manufacturers Cup Event at Newcastle, September 14-16 that will surely appeal to a vast array of Karters. Continuing with their rapid growth, Nitro Kart has stepped up as title sponsor of the event, now known as the Nitro Kart Fall Nationals. In their 2+-year existence, Nitro Kart has already covered podiums all around the country. In preparation for the class to be added Nationally in the 2019 Manufacturers Cup, LO206 Cadet has been added as a Local Option at Newcastle. The class will run the same schedule as the National Classes, with Friday Practice, and Races both Saturday and Sunday. Continuing its support of the Collegiate and High School Electric Karting Series, WKA will be bringing the program to Newcastle, running parallel with the Manufacturers Cup Event. The Series will Practice Friday and Race Saturday on Newcastle’s East Track. Stadium View Network will return the film the Manufacturers Cup Race Weekend, Saturday and Sunday, filming the finals to air on their distribution network, made up of over 6,000 restaurants, sports bars and entertainment venues across the country; some LIVE and some recorded playback. More information to follow. For the second event this year, WKA extends special pricing to enter the Manufacturers Cup event at Newcastle for basically the cost of race tires. Yamaha Sportsman only pay $195 for the weekend, while Yamaha Senior drivers will only pay $415. New to WKA? Haven’t renewed your membership with WKA in 12-or-more months? Special membership pricing is available at Newcastle just for you at the special price of just $20. Entry Forms and information are available at www.WorldKarting.com or accessed from the buttons below. More information to follow in the near future. CONCORD, NC - After a short hiatus from the National Karting Scene, the popular KA100 Throwdown returns, July 14 and 15 at Concept Haulers Speedway in Sheridan, IL. 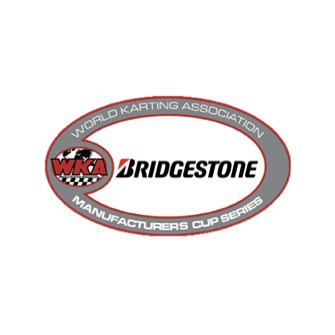 WKA, together with Franklin Motorsports, will host the competition during the fourth stop of the 2018 Bridgestone Manufacturers Cup. 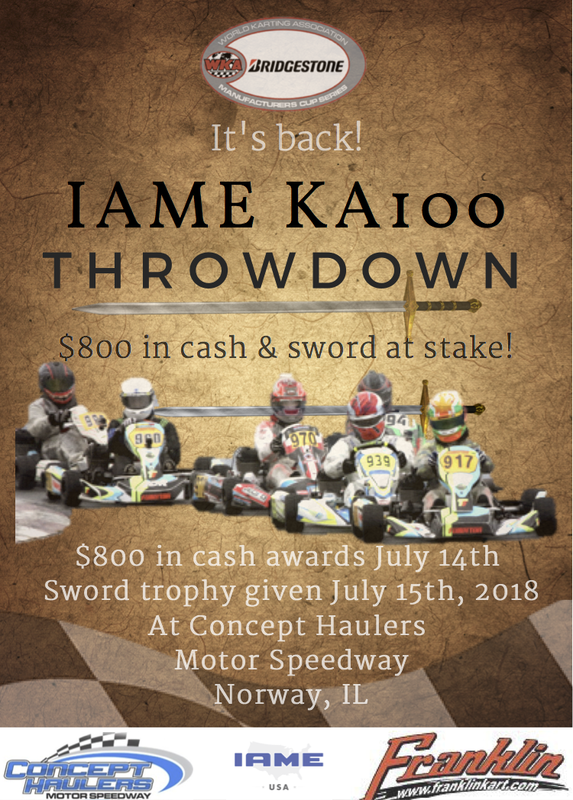 In additional to huge bragging rights that comes with this historical event, KA100 Senior Drivers will fight for a cash purse of up to $800 Saturday, July 14, and the all-important, one-of-a-kind Throwdown Sword Award Sunday, July 15. Previous editions have treated spectators to amazing racing, and this year's edition will certainly not disappoint. Prior to the main event, a random draw for a kart number entered for the weekend will take place. If your number is drawn, that driver will receive an automatic $50.00. If that kart number wins the race, the driver will also receive a $250.00 bonus on top of their $200.00 winner’s purse. WKA will be offering its temporary membership once again for the balance of the 2018 season. For only $20.00 for any person who has not been a member in the last twelve months or have not been a member in the past. At the conclusion of the event, any temporary members can become a WKA member can apply the $20.00 fee to a full membership. CONCORD, NC - Pre-registration closes at 11:59pm on Wednesday, May 9th. Pre-enter today to take advantage of $100 off at-track pricing. Concord, NC - With a Board of Trustees meeting held less than two weeks ago, one of the big items conveyed during that meeting by new President Kevin Williams was a return to growth through club, regional and national racing. The new World Karting Association (WKA) President, with support from the WKA Board of Trustees, has decided it is in the best interest of the membership and new direction to move the July 13-15 event scheduled at New Jersey Motorsports Park to Concept Haulers Motor Speedway, outside of Chicago (CHMS). WKA understands that changing schedules mid-season is not ideal, but was needed to better serve the WKA Family of racers. Many competitors participated in the historic Daytona Kartweek and chose to skip the second event weekend and utilize that as a drop race in their program but are reminded that attending the balance of the series they are still championship eligible. WKA invites everyone, existing and new participants, to race its events to experience the WKA atmosphere. Concept Haulers Motor Speedway replacing the New Jersey Motorsports Park event will now serve as the final round in the run for the very generous IAME USA East prize announced back in early March, of representing the USA and the World Karting Association at the IAME international Finals at Le Mans, France later this year. 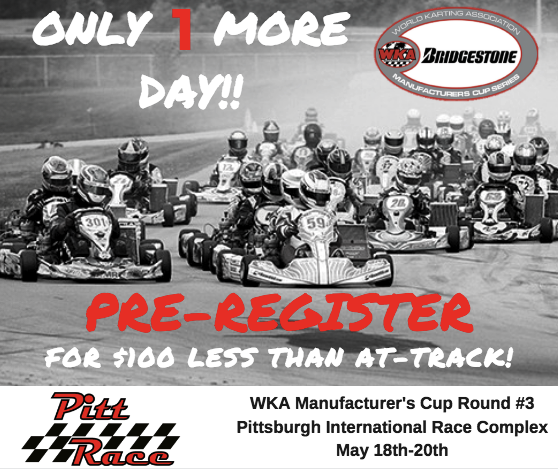 Look for many more big announcements by WKA and please be reminded that paper and online entry blanks are now available online at www.worldkarting.com for the next Manufacturer's Event, the Keystone Spring Nationals at Pitt Raceway May 18-20. Development can also be found on Twitter at @RaceTechDvlp as well as Facebook at their Race Tech Development Fan Page. CONCORD, NC - It’s Spring. And that means the next round of the WKA Bridgestone Manufacturers Cup is fast approaching. The series will once again converge on the Pittsburgh International Race Complex, May 18-20, for the Spring Nationals, a favorite mid-year stop for many of the ManCup Competitors. Mid-season events have been some of the most exciting racing in WKA’s history due to the Championship battles that start heating up, and the Pitt Spring Nationals are expected to be just as exciting as previous years. After a successful first outing last month, WKA has once again employed its new Online Registration System, simplifying the process for all classes. The new system, introduced for Round 2 of the Bridgestone Manufacturers Cup, allows competitors to register for their classes, rent transponders, AND reserve their pit space, all in one quick and easy process. What’s more, the process is optimized for both desktop and mobile devices! CONCORD, NC - TODAY IS THE LAST DAY! Online registration closes at midnight on March 14th for the second round of Manufacturer's Cup series. The event is being held at GoPro Motorplex in Mooresville, NC. Online registration saves each racer $100.00 per class over registering at the track. CONCORD, NC - With the growing numbers in the LO206 cadet class at GoPro Motorplex it has been requested that WKA run this class as a local option next week at the Bridgestone Manufacturers Cup race March 23-25th . Please register online on the WKA website by clicking HERE. Entry fee of $430.00 includes one set of Bridgestone450 YLC race tires. GoPro Muffler is required. CONCORD, NC- As we get geared up for the upcoming Manufacturers Cup race at GoPro Motorplex, March 23-25,2018 we wanted to clarify Pit Parking. Due to the limited parking in the pit area, there will be no RV/camper parking in the pit area. Camping will be located on the outside of the gated area. Please refer to the Parking Map for your pit selections. If you have special parking request, we will try to honor them as much as possible. Payment is required at time of reservation. CONCORD, NC - The online and paper entry blank is now available for the upcoming Bridgestone Manufacturers Cup at GoPro Motorplex in Mooresville, NC, March 23rd-25th, 2018. When registering online you may notice a new registration system. The new system will stream line the registration process moving forward, allowing each driver the ability to save their information for future transactions, so you do not have to enter your information in each time when registering for an event. The new system will also sync with the new barcoding scanning system for tires, engine and chassis seals, that will be implemented at the GoPro event and throughout the remainder of the 2018 season. All mail in Pre-Entries must be received in the office by Wednesday March 14th, 2018. On-line registration ends at midnight March 14th. At track registration is an additional $100 per class. CONCORD, NC - Responding to Member comments and requests to bring back the popular Kid Kart Category back to the National Scene, the WKA Board of Trustees recently responded to member requests by voting the class back into the WKA Bridgestone Man Cup as a National Class at their recent meeting. The popular category for aspiring young drivers will be added to the Bridgestone Manufacturers Cup class list immediately, and entries for the upcoming event at the popular GoPro Motorplex in Mooresville, NC, scheduled for March 23-25, 2018. Tech Regulations are as printed in the 2018 WKA Technical Manual, 214.1 KID KART. Legal fuel will be the same as all other classes, Sunoco 110, mixed with Redline Oil, 8-oz., per gallon. CONCORD, NC - The entry Deadline for the Margay Sprint Nationals Manufacturer's Cup event is this Sunday, December 17th. This is the first time we are doing the race tire distribution. Please help us out by Pre Registering so we can get a accurate tire count and also save yourself $100.00 at the track. No exceptions will be made after the December 17th deadline. TO ENTER ONLINE, CLICK HERE. TO FAX IN YOUR PAPER BLANK (704)455-1609, CLICK HERE. We look forward to seeing you all at the speedway for #KARTWEEK! CONCORD, NC - Clarifying yesterday's announcement regarding Class Age Structure for the 2018 Manufacturer Cup Classes, starting with the Daytona event in a couple weeks, WKA Officials recognized that some of the terminology in the announcement and on the WKA website at the time of the announcement was inconsistent with the 2018 WKA Technical Manual. Officially, as of this release, the printed 2018 WKA Technical Manual has the most recent and correct guidance for Age Regulations and we have also listed it below for each class. WKA apologizes for any confusion yesterday's announcement has caused. Please feel free to contact the WKA Office should you need further clarification, 704-455-1606, or fax 704-455-1609. CONCORD, NC - World Karting Officials are proud to announce the addition of the IAME KA100 Senior Class as part of the national class structure for 2018 for the Bridgestone Manufacturers Cup Series. While the KA100 Senior will begin its national points season at Daytona, many drivers can get a head start in just a couple weeks at GoPro Motorplex in Mooresville, North Carolina for the Top Kart USA Grand Nationals, as the class will be featured as a Local Option Class the weekend of Oct 13 and 14. Competitors in that class will have the opportunity to practice all day Friday with the 8 national classes on hand, as well as race on Saturday, with awards being presented to the top 3 finishers in the Saturday event. As an added bonus for the new class, the GoPro Entry Fee includes 1 free set of Bridgestone YLC Tires for the weekend, as well as a WKA Membership, which will also carry them through the Daytona event in December, enabling them to kick off a new season with the class. Expiration on the membership will be January 1, 2018, affording competitors the ability to not have to renew their membership until the March 23 Mfg Cup event at GoPro Motorplex, which would serve as stop #2 for the 6-race series in 2018. With the addition of a 6th national event in 2018, all national competitors can also count their best 9 of 12 finishes for the season, beginning at Daytona. The IAME KA100 Senior Class officially replaces the LO206 Senior class for 2018. For competitors in the KA100 Senior Class, as well as the other 8 current national classes, pre-entry deadline for the Top Kart USA Grand Nationals is October 6th. Be sure and take advantage of the pre-entry pricing. To view the Paper Entry Blank, CLICK HERE. CONCORD, NC - Bridgestone Officials have notified World Karting Association, that due to a lack of ample supply of Bar Coded YLM Tires, and in an effort to ensure that competitors in the Pro IAME Junior and Senior classes are well covered for the season ending Grand National event October 13-15 at GoPro Motorplex in Mooresville, North Carolina, the new Bridgestone YNB Compound would be the tire that will be utilized. All competitors in these 2 classes who have pre-entered by the October 6 deadline, will be issued 1 free set of practice tires, as well as 2 sets of race tires for the weekend. Tire pick-up will begin at noon on Thursday Oct.12th. Additionally, any drivers in these 2 classes who still have the Bridgestone YLM Tires in the wrapper, can do a one for one exchange for the new YNB compound tire at the event. Bridgestone asks that competitors contact, Margay Racing Products at (314) 771-4242 or Grand Products at (215) 244-1940 with the quantity of each size so they can have the proper amount at the event for exchange. As Bridgestone enters its 40th year of supplying premium kart racing tires to the US Karting market, Bridgestone Kartsport would like to confirm its product line for the 2018 season and beyond. Consisting of two new compounds (YNB, YNP) along with two existing compounds (YLC, YDS), Bridgestone continues its practice of offering a complete range of tires for all sprint kart racing applications. Homologated with CIK-FIA as the ‘prime’ compound, the Bridgestone YNB has already proven to be an outstanding tire in the KZ & KZ2 categories in WSK, the CIK World Championship and CIK European championship and will replace the YLM compound typically used in premier-level racing in the US. Bridgestone has long been the tire of choice when it comes to wet weather racing and that dominance is set to continue with the new YNP rain tire which features a new compound and more aggressive tread pattern and replaces the YLP compound. The YLC and YDS compounds have proven to be ideal tires for club, regional and national level racing for several years and both compounds will remain unchanged for 2018. Continuing a relationship that exceeds 25 years, Bridgestone will be the exclusive tire supplier for the World Karting Associations 2018 six-race Manufacturers Cup series. Please note: durometer readings are taken at a temperature of 23 degrees Celsius +/- 2C (73.4F +/- 3.5F) with a humidity of 50% +/-5%. This decision was made as a result of the ongoing professional relationship between Bridgestone and WKA, with officials feeling this is the absolute best way to maintain as level a playing field as possible in the midst of an unexpected situation. NEW CASTLE, IN - The opening round of racing for the 2017 WKA Bridgestone Manufacturers Cup Series Team Empower Nationals went into the books Saturday at the New Castle Motorsports Park. The fifth round of the 2017 championship chase marked the halfway point of the season, with a solid turnout of competitors in all eight categories, nearly reaching the 150 mark for the day. After cloud covered the New Castle, Indiana area for much of the morning, the skies cleared and the humidity rose, making for a challenging day for the competitors chasing the right setup. Five drivers had the pace to compete for the win in the KartSport North America Pro IAME Senior division. Top qualifier Braden Eves (Zero Error / Kosmic) and double heat race winner Brandon Lemke (Top Kart) were joined by Daytona winner Brandon Jarsocrak (KSNA / Praga), Garrett Johnston (Top Kart) and Alexander Kardashian (Top Kart). In the end, it came down to the 3 B’s. They shuffled for the lead throughout the main event. Coming to the white flag, Eves made a great move at the I-70 corner to go from third to first. That shuffled them up taking the white, and Jarsocrak emerged from the first turn with the lead. He held the advantage throughout the last mile, crossing the line first for the victory. Eves came in a close second over Lemke with Kardashian placing ahead of Johnston. Eves came into the weekend leading in both championships, including the FranklinKart.com Yamaha Senior division. Eves (Zero Error / FA Kart) found himself battling with Alexander Kardashian (Top Kart) in qualifying and the heat races. Kardashian set fast time in qualifying and won Heat #2 with Eves taking the opening heat. Dakota Pesek (Top Kart) and Jake Venberg (Merlin) joined them at the front in the main event. The two Top Kart drivers locked up and were able to get away, deciding the race on the final circuit. Kardashian led going into the final corner, driving the defensive line. Pesek pulled a ‘Cole Trickle’, running the outside line and making it hold through the corner. Kardashian had to pinch the exit, slowing his pace. This allowed Pesek to carry the momentum into the lead and to the victory by 32 thousandths of a second. Kardashian settled for second with Eves beating Venberg for the third podium step. Marina Walters (Top Kart) completed the top-five. Last year at the season finale, Tyler Gonzalez walked away with two wins on the weekend in the Woltjer Racing Engines Pro IAME Junior. Today, it was a dominating performance by Junior rookie Tyler Maxson (SCR / Tony Kart). After qualifying second, Maxson went on to win both heat races before dominating the main event with a 5.6-second advantage. Top qualifier Connor Ferris (Top Kart) won the battle for runner-up ahead of Tahlon Yockel (Tony Kart) and Spike Kohlbecker (Margay). Point leader Pauly Massimino (Top Kart) drove to fifth. Colin Neal (MDD / Tony Kart) and Elliott Budzinski (Kart Craft / Tony Kart) came into the weekend tied for the championship and in the win column with two victories a piece. They broke both ties with a showdown to close out the day. A red flag came out with five laps remaining in the main event, involving top qualifier Zack Pretorius (Comet / FA Kart), double heat race winner Spike Kohlbecker (Margay) and Tyler Ferris (Top Kart). The incident bunched up the field for a shootout to determine the day’s winner. Neal and Budzinski came out as the top two drivers, with Neal holding the advantage at the checkered flag for his third victory of the season. Budzinski came 41 thousandths short at the line with Matthew Mockabee (Comet / Tony Kart) joining them on the podium. Junior rookies Kaden Wharff (Top Kart) and Donald Whorton (FA Kart) completed the top-five. The IAME USA East Pro Swift Sportsman came down to two drivers. Santiago Trisini (Benik) and Annie Rhule (Energy) were able to get away from the field early and maintain an advantage while the rest of the field battle for position. Trisini led for most of the race with Rhule waiting for an opportunity to work past. On the final lap, Rhule made her move but Trisini fought it off, going on to take the checkered flag for his first victory of the season. Rhule settled for runner-up with Connor Zilisch (Energy) winning the battle for third over Chloe Chambers (Benik) and Logan Adams (Benik). Anyone in the Allison Racing Engines Yamaha Sportsman field had the chance to win. For Sam Hinds, it was his turn. Most of the field ran together until five drivers broke away. Hinds (FA Kart) led with the Adams brothers Garrett (Energy) and Logan (FA Kart) working together. Double heat race winner Connor Zilisch (Energy) tried to break up the trio at the front, but could not stay ahead of them. Coming down to the finish, Hinds led with Garrett on his bumper. The two drag-raced to the line with Hinds able to reach the line first by nine thousandths of a second. Logan completed the podium with Chloe Chambers (Benik) able to take fourth away from Zilisch. The CRP Racing Mini Swift also welcomed a first time winner with Ben Maier taking the victory. Four drivers battled for the lead position throughout the main event, all taking a turn at the point. Christian Miles (Formula K) appeared to be the quickest driver coming off the Heat #2 win with top qualifier and Heat #1 winner Mateo Rubio-Luengo (Benik) right there. Indy driver Elliot Cox (Energy) joined the fight with Maier emerging at the end of the race as the driver to beat. Coming to the checkered flag, Maier was able to edge out Mateo by eight thousandths of a second. Cox completed the podium in third with Miles ending up fourth. Danny Dyszelski (Benik) rounded out the top-five. David Kalb Jr. went from zero to hero on the day in the Briggs 206 Senior division. Kalb (Eagle) was shuffled off the track in the opening heat race, placing 10th. Up front, three drivers each led a session with Zach Linsell (MGM) posting fast time in qualifying while Track Kart drivers Eric Fagan and Evan McCorquodale each took a heat race win. Kalb worked his way forward in Heat #2, placing third, helping to move him up on the main event grid. Kalb was the quickest kart on the circuit in the main event. Once joining the top three, Kalb worked his way to the point. Once there, he held the enough gap on the final circuit to cruise to the victory, his first on the year. Fagan drove to second with McCorquodale third. Linsell ended up fourth with Dustin DeMattia (Keener) placing fifth. The final day of action completed Sunday at the New Castle Motorsports Park for the WKA Bridgestone Manufacturers Cup Series Team Empower Nationals. The New Castle, Indiana facility provided great weather all weekend long with warmer conditions all day. The racing all weekend was great, with many of the races coming down to the wire. In the end, six of the eight classes saw drivers double up in the win column. Brandon Jarsocrak notched his third victory of 2017 at the Manufacturers Cup, coming out of the 20-lap battle in the KartSport North America Pro IAME Senior as the top driver. Top qualifier and Prefinal winner Brandon Lemke (Top Kart) led the majority of the race with Braden Eves (Zero Error / Kosmic), Alexander Kardashian (Top Kart) and Jarsocrak. Kardashian led early with Lemke taking over. It looked as they would be able to lock up and get away, however the rest of the lead pack, including local guest Zach Holden (Comet / Tony Kart) would not let that happen by breaking them up. Holden retired at the halfway point with a broken chain, holding up South African driver Fabienne Lanz (VSR / Tony Kart), thus making it four at the front. Coming to the white flag, Lemke and Jarsocrak went back and forth for the lead. Jarsocrak took over the point at turn one, and Eves went on the attack for second on Lemke. This gave ‘Money’ enough space to reach the checkered flag first. Eves edged out Lemke for the second spot with Kardashian placing fourth. Lanz followed back in fifth. Braden Eves (FA Kart) and Saturday winner Dakota Pesek (Top Kart) came away as the top two drivers in the FranklinKart.com Yamaha Senior. Eves set fast time in qualifying with Pesek coming away from the Prefinal battle with the win. The two were able to break away from the field in the 18-lap main event. The drag race to the line went to Pesek by 24 thousandths, earning his second win on the weekend and third straight counting the Sunday victory at Pittsburgh. Tyler Trent (Tony Kart) won the battle for the final step on the podium with Jake Venberg (Merlin) and Marina Walters (Top Kart) placing fourth and fifth. It was a dramatic day in the Woltjer Racing Engines Pro IAME Junior division. Round Four winner Tyler Ferris (Top Kart) set fast time in qualifying and came away with the Prefinal win after both Saturday winner Tyler Maxson (Tony Kart) and Connor Ferris (Top Kart) retired early while leading. Each started at the back of the 21-kart field in the 20-lap Final. Up front, Junior rookie Kaden Wharff led a Top Kart train of Ferris and Pauly Massimino while fellow rookie Caleb Bacon (Tony Kart) looked to move forward. Everyone however was watching the progress of Maxson, who continued to click off the fast laps of the race. By the halfway point, Maxson was stalking the top-five, and lap 18, took the lead from Wharff. Maxson went on to take the second victory of the weekend with Bacon able to edge out Wharff at the line for second. Tyler Ferris ended up fourth with Massimino in fifth. Sunday was a notable day for the championship chase in the Comet Racing Engines Yamaha Junior class. Championship leaders Elliott Budzinski (Tony Kart) and three-time winner Colin Neal (Tony Kart) each had issues in the main event. Budzinski retired early after contact while Neal, who won the Prefinal, was leading the main event until a chain broke with four laps to go. This left three drivers to fight for the victory – top qualifier Spike Kohlbecker (Margay), Tyler Ferris (Top Kart) and Caiden Young (Tony Kart). Coming to the line, Kohlbecker was able to lead out of the I-70 corner. Ferris set up for a pass on the inside down the stretch, but switched back to the outside as Kohlbecker drifted to the left. This slowed Ferris progress enough in the slingshot attempt to give Kohlbecker the advantage at the checkered flag by 87 thousandths of a second. Young followed closely in third with Jack Dorsey (Tony Kart) beating Zack Pretorius (FA Kart) for fourth. Santiago Trisini (Benik) was one of the six double winners on the weekend, scoring the Sunday victory in the IAME USA East Pro Swift Sportsman division. Four drivers made up the lead pack with top qualifier and Prefinal winner Chloe Chambers (Benik) getting away at the start thanks to a rough opening corner that included a flip by point leader Ashton Chilton (Nitro Kart). He and everyone else walked away unhurt as the race continued. The trio ran her down by the halfway point with Trisini taking over the point. From there, he led the group for the remainder of the race and won the race to the checkered flag for the victory. Thomas Schrage (PCR) took second with Chambers in third. Connor Zilisch (Engery) was a close fourth with Elio Giovane (Benik) winning the battle for fifth. The Allison Racing Engines Yamaha Sportsman division went down to the wire. Garrett Adams (FA Kart) and Saturday winner Sam Hinds (FA Kart) led the majority of the race with Chloe Chambers (Benik) and Annie Rhule (Energy) looking to make a move. It was not until the last push to the checkered flag that anything happened. Adams and Hinds went side-by-side with Chambers pulling the slingshot, going from third to first by the checkered flag to score her first WKA victory in her first event with the series and visiting the New Castle circuit for the first time. Adams was off by 46 thousandths with Hinds in third. Rhule was fourth with Mateo Rubio-Luengo (Benik) in fifth. It was four drivers in the hunt early for the CRPRacing.com Mini Swift category until it came down to two at the end. Saturday winner Ben Maier (Nitro Kart) and Mateo Rubio-Luengo (Benik) were the two left standing at the end, with Maier winning the race to the checkered flag by three hundredths of a second. Sebastian Ng (Nitro Kart) was able to make a run at the end of the race to steal third away from Christian Miles (Formula K) and Elliot Cox (Energy) who faded away at the end. The victor in the Briggs 206 Senior class was decided off the track. On the track, it was a three wide finish with Evan McCorquodale (Track Kart) crossing the line first by four hundredths of a second over David Kalb Jr. (Eagle) and Eric Fagan (Track Kart). In tech, McCorquodale failed a muffler measurement, and had the win removed. This put Kalb on top of the podium for a second time this weekend. Zach Linsell (MGM) was moved to third ahead of Kyle Fogt (CompKart) and Dustin DeMattia (Keener Kart). (Original story by David Cole of eKartingNews.com) - The 2017 Bridgestone World Karting Association Manufacturers Cup Series is set to return back to action after taking the month of June off. The third stop of the 2017 championship chase takes teams and competitors to the famed New Castle Motorsports Park for the Team Empower Nationals. The July 14-16 event will host Round Five and Six on the season to mark the halfway point for those vying for the eight championship titles in a best 8 of 10 format. Over 100 entries have pre-entered for the weekend with a number of additional drivers and teams scheduled to arrive in New Castle, Indiana to contest the 1-mile circuit owned by IndyCar driver Mark Dismore. The weekend also marks the second event for the Bridgestone Mid-Season Shootout. Opening in Pittsburgh, the mini-series that includes the Dousman weekend will award tickets to the Rok Cup International Final in Lonato, Italy. Bridgestone will send the top point earner in the mini-series from Pro IAME Senior, Pro IAME Junior, Pro Swift Sportsman and Mini Swift to the October event. Those who finish the mini-series at the top of the standings in the Yamaha Senior, Yamaha Junior, Yamaha Sportsman and Briggs 206 divisions will receive entry fee, race tires, and drivers pit pass to the WKA Grand Nationals at the GoPro Motorplex in Mooresville, North Carolina on October 13-15. With his victory in Round Four, Braden Eves (MDD / Kosmic) has taken over as the championship leader in the KartSport North America Pro IAME Senior standings. A 25-point advantage over Round One winner AJ Myers (TB Kart USA), as the two are the clear favorites reaching the halfway point. Four different drivers have been victorious on the year, including Daytona winner Brandon Jarsocrak (KSNA / Praga) returning for New Castle after missing Pittsburgh. Former WKA champion Brandon Lemke (Top Kart USA) got back on the winning ways with the triumph in Wampum, ready to move up into the championship chase. Eves (MDD / FA Kart) moved into the lead of the FranklinKart.com Yamaha Senior standings as well following his Pittsburgh performance. Winning Round Three, Eves is the only non-Top Kart driver to win on the year thus far. Round One winner Alexander Kardashian (Top Kart) sits second in the standings with two-time winner Dakota Pesek (Top Kart) trailing by 90 points after four rounds of racing. Merlin driver Jake Venberg and Carter Pease (Top Kart) complete the top-five in the standings, with another solid field of Yamaha drivers expected in New Castle. Four different drivers have won on the year in the Woltjer Racing Engines Pro IAME Junior category. Round Three winner and defending champion Pauly Massimino (Top Kart) holds the lead in the standings with a 100-point advantage over Tahlon Yockel (Tony Kart). Tyler Ferris (Top Kart) is the only other 2017 winner scheduled to compete in New Castle, currently sitting fifth in the standings behind Colin Gasparini (Tony Kart) and Max Peichel (Tony Kart). Colin Neal (Tony Kart) and Elliott Budzinski (Tony Kart) have exchanged wins through the first two events of the season in the Comet Kart Sales Yamaha Junior category. The two have posted the same amount of points over the first four rounds of racing, heading into New Castle to break up the tie. Tyler Ferris (Top Kart) is not too far behind with four straight top-three finishes to sit 15 points back of the duo. Caiden Young (Tony Kart) and Emory Lyda (Merlin) round out the top-five in the standings with nearly 20 drivers already pre-entered for the weekend. Two wins and two additional podium finishes have kept Ashton Chilton at the top of the standings for the IAME USA East Pro Swift Sportsman. The Nitro Kart driver holds a 180-point advantage over Round Three winner Connor Zilisch (Energy) heading into New Castle. Brent Crews (Nitro Kart) left Pittsburgh with two runner-up results to move him into third in the standings ahead of Santiago Trisini (Benik) and Logan Adams (Benik). The Allison Racing Engines Yamaha Sportsman class also holds four different winners on the season. The most recent winner, Mateo Rubio-Luengo (Benik), leads the championship chase. Mateo holds a 35-point advantage heading into New Castle over hometown boy and Round Two winner Garrett Adams (FA Kart). His brother, Logan Adams (FA Kart), is third in the standings over Sam Hinds (FA Kart) and Thomas Schrage (PCR). It is two wins a piece for Caleb Gafrarar and Mateo Rubio-Luengo in the CRPRacing.com Mini Swift division. Gafrarar won Round One and Four, with Mateo (Benik) earning the other two rounds. Gafrarar (Parolin) holds the advantage in the standings by 55 markers heading into the New Castle weekend. Ben Maier (Nitro Kart), Elliot Cox (Energy) and Miles Murray (Nitro Kart) compete the top-five in the standings to this point. Zach Linsell has been the most consistent driver over the first four rounds in the Briggs 206 Senior championship chase. Linsell (MGM) leads by 102 points over Pittsburgh double winner Eric Fagan (Keener Kart). Jeremy Warren (Track Kart) sits third over Dustin Demattia (Keener Kart). CONCORD, NC - With the deadline for the TEAM EMPOWER Nationals falling just a day after the 4th of July, and many using Monday the 3rd as an extended holiday weekend, World Karting Officials have moved the Pre Entry Deadline for the July 14-16 national event at New Castle Motorsports Park to Friday July 7, thus giving everyone a chance to get back in the swing of things after the Tuesday holiday. To register online for the event, CLICK HERE.